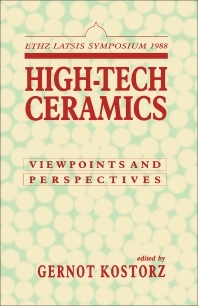 High-tech ceramics pose many challenges to the scientist and engineer because of their demanding production and processing requirements. Leading experts in the field address these problems not only from a fundamental scientific point of view but with particular reference to a broad range of engineering applications. This edited volume is based on invited talks given at a symposium held at the ETH Zurich in November, 1988, sponsored by the International Latsis Foundation of Geneva. Materials scientists and engineers, condensed matter physicists, and mechanical engineers.